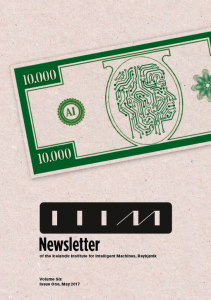 In this issue we explore the relationship between AI and the economy. The global financial system is a world-spanning network, which creates a causal relationship between people in separate corners of the world. IIIM’s Threadneedle project presents a new approach for economic research built on simulating the banking system and exploring the frameworks’ behavior, and their influence on macro- economic stability. Simulation has proven very beneficial for deepening the understanding and improving other distributed systems and has lead to successful building of computer networks, models of biological systems and the Internet. This issue also offers an insight into Artificial Pedagogy, the science of how to teach artificial intelligence. Research scientist Jordi Bieger answers some of our questions about the bringing up of artificial systems. His research revolves around teaching AI with an emphasis on systems that aspire to reach or surpass human-level intelligence. Furthermore there is recollection of IIIM and CADIA’s AI Festival which also focused on AI and the Economy.